$20 for $40 Worth of Fun, Personalized Gifts! New Shoppers Get it for $17! 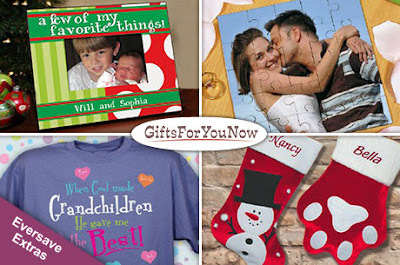 Head on over to Eversave you can can score $40 worth of personalized gifts from GiftsForYouNow.com for as low as $17! I checked out the site and there's tons of cute gifts, especially for babies, like stockings, blankets, stuffed animals, keepsakes and much more! The vouchers are on sale for $20, but if you're a new Eversave member, you'll get an instant $3 credit when you sign up, letting you get if for $17! You'll be able to use the credit code as soon as you purchase it...no waiting around to redeem a voucher!